How many of these can you check off? 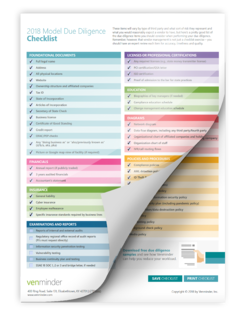 Start off your 2018 vendor due diligence off right with our Model Due Diligence Checklist! While we all recognize that vendor management is not a checklist exercise, we thought it would still be helpful to have a list to refer to when thinking through the due diligence items you should consider when performing your due diligence on any vendor. Whether you save it to your desktop or print it and hang it on the wall, this guide will be a helpful reference tool to you and your team during your due diligence process.